Since the release of their sophomore record I Don’t Run earlier this year, it would be rare to find the girls of Hinds anywhere but on tour. The four-piece from Madrid performed the Birmingham leg of their UK/European tour at newly renovated The Mill. Following an electric performance from indie rockers Sports Team (which was enjoyed by Ade Martin (bass) and Amber Grimbergen (drums) of Hinds who joined the audience to watch the performance), Hinds bounded onto the stage with as much energy as ever before – a life on the road has not tired them out. It was a particularly chilly evening, that same chill seeping into the venue, meaning a lot of the crowd chose to remain in jackets. The cold was clearly felt by the band too, Carlotta Cosials (frontwoman/guitar) opting for a checked scarf. But it wasn’t long though before the infectious energy supplied by the band got the crowd moving, increasing the temperature substantially. Commencing the gig with ‘Soberland’ from their most recent album, we were immediately graced with the catchy, lo-fi riffs the girls are well-known for. It wasn’t long before the crowd began to jump around, with a little encouragement from second frontwoman/guitarist Ana Perrote. She accused the British of being too polite and urged us to get a bit crazier as the Spanish do. Aptly, they went on to play their latest single ‘British Mind’, alongside ‘Easy’, ‘San Diego’ and ‘Garden’, classic fan favourites from their debut Leave Me Alone which was released nearly three years ago. It was at this point that the crowd truly settled into the vibe, beginning to cause chaotic moshes as the addictive melodies had everyone singing along. It was pleasing to see what a range of fans Hinds have accumulated. There were plenty of the expected teenage girls and boys, drunkenly bopping about at the front, attempting to catch Ana as she tried a stage dive during their cover of ‘Spanish Bombs’ by The Clash. But observing from further back were a number of older fans, many couples, and some younger members with parents. Their laid-back, fun, no-fucks-given vibe understandably appeals to a lot of people, and is only going to increase as they progress in their career. After a mixture of old and new to bring the party to a close, pre-encore the venue filled with fan cries of “VIVA HINDS! VIVA HINDS!” — a chant that the girls have popularised through previous tours and their use of social media. Satisfying the desires of the crowd Carlotta, Amber, Ana and Ade rejoined on stage for a final performance of ‘New For You’, the first single from their latest record. 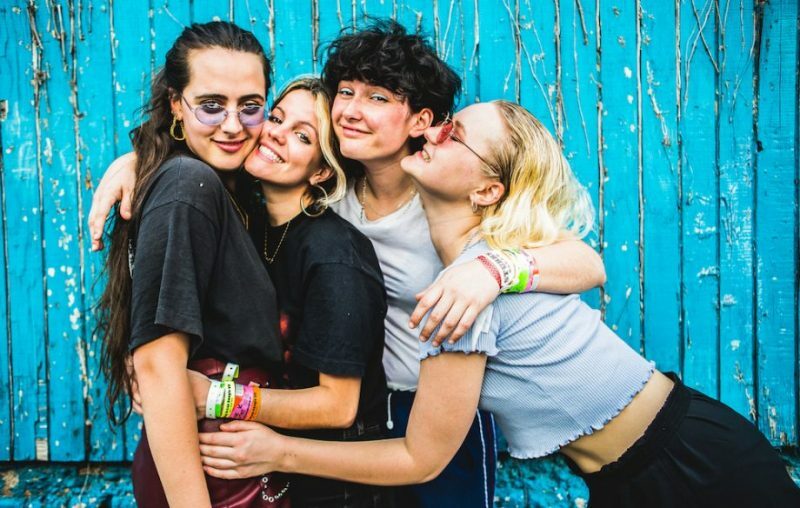 Hinds are one of those bands the UK will beg to come back. Their noisy, exciting and high-spirited performances are enjoyed by crowds as much as the band are clearly loving it themselves.